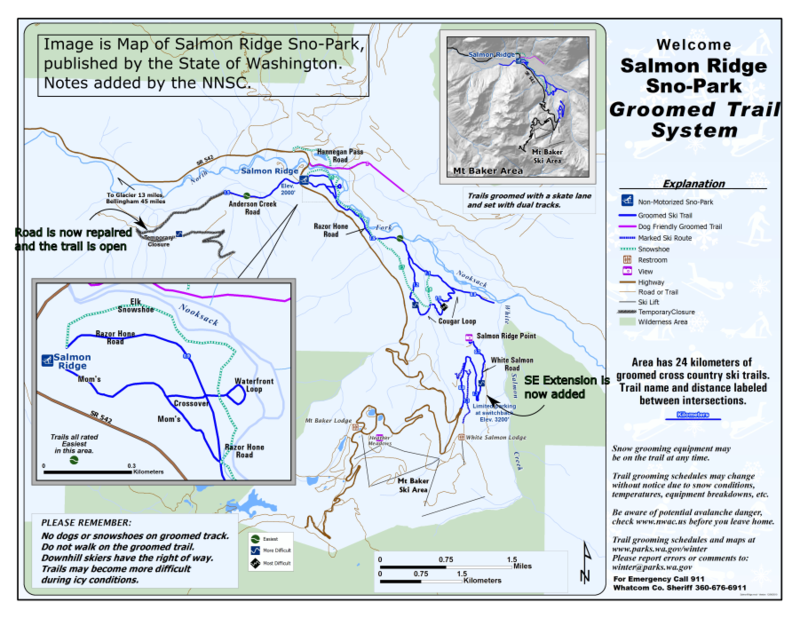 Salmon Ridge Sno-Park is located 13 miles east of Glacier, WA. just past milepost 46 (or about 45 miles east of Bellingham) on Washington State Route 542, across from Silver Fir Campground. As you are driving out Mt. Baker Highway, you will see mileposts in the 40’s. After milepost 45, you will see a *large* highway maintenance camp on the left – you can’t miss it. Slow down. Next, there is a turn-off on the left for the Hannegan Pass Road. Slow down some more. You will then immediately cross a bridge over North Fork of the Nooksack River. Slow down even more! There is then a large sign on the right for the Silver Fir Campground – directly across on the left is the entrance to the Razor Hone SnoPark. Turn in (look carefully for oncoming traffic), park, and enjoy your ski/snowshoe! This map created by Ken Wilcox gives you the “big picture” of where we are. This map gives you a closer view of the area in the inset at upper right. This map created by Ken Wilcox and Gail Garman shows you an overview of the trails. To get more information about our trails, please click on the trails link. 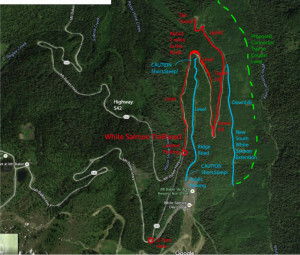 Click on the map or this link for a separate White Salmon page with larger map and further descriptions.